The fork piece was introduced quietly in 1923, and although Meccano part numbers were already up to 138, it was dropped in one of the many spaces after the threaded pin at part number 116. It appears in the parts listing in the May 1923 manual, and was announced in the Meccano Magazine. I can't really work out why it was included in these outfits, though. The only model in the entire 1923 manual to list part 116 is number 307, "Oscillating Steam Engine". However, this is a typo and the model doesn't use the part – it's corrected in the 1924 manual. No other models use the fork piece. Is it possible that the contents of outfits were determined from the parts listings in the manual, resulting in all outfits from number 3 gaining a fork piece, and this mistake was not picked up? 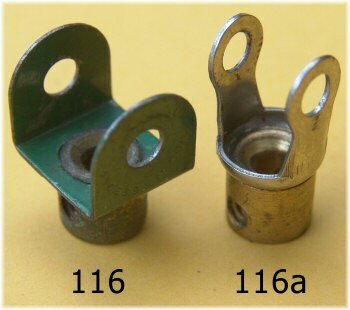 Although the universal coupling part number 140 was introduced in 1925, it was supplied dismantled as the swivel bearing in 1927, and the other part became the small fork piece, part 116a. Both of these parts were announced in December 1927's Meccano Magazine, and were added to the outfits in 1928. The large fork piece has had only one significant modification since its introduction. Originally the boss was mounted randomly on the part, as with most other bossed parts. 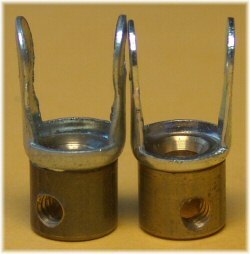 At some point, it was realised that the part would be more useful if the double-tapped thread were aligned with the gap in the fork, such that it could be driven by a screwed rod through its boss. The picture to the right shows a modern aligned boss and an older 'random' boss behind, with screwed rods in the boss to shown what differece a tiny alignment variation makes. Of course, when I say "mounted randomly" the tapping of the boss was mostly likely done before the boss was mounted on the earlier parts, and after the boss was mounted on the later parts. DMS/EMP gives this change as being with the start of the gold period in 1934, but I have gold versions of both types. The only reasonably datable parts I have are random in the lettered outfits, and aligned in the numbered ones. This would suggest a possible date of around 1937, but we would need a lot more data to be certain. It is obviously between 1934 and 1941, and most likely early in this range. Of course, no sooner do I write this than I get an email from John Nuttall saying that all of his nickel-plated large fork pieces are indeed lined up, but differently from the later versions. 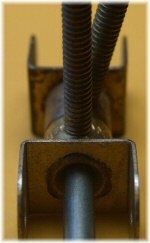 The stamping on pre-war parts is Reg No 698054 with or without Meccano on the same fork, sometimes with Fabrique En Angleterre on the opposite side. Post-war the stamping changes to the plain Meccano England shown on the right-hand example. I can't think of another curved stamping from post-war UK production like this. 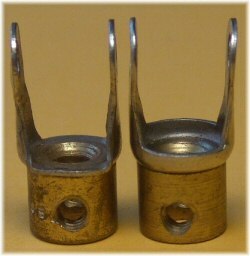 The most well-known variation in the small fork piece is the change from a simple bent strip in the very first versions to a rounded shoulder all around the boss, as shown in the picture to the right. It is not known exactly when this occurred; pictures of the part are few and far between, and most appear in the supermodels and parts listings which are likely to be reprinted from earlier pictures. The date of the change is certainly between 1930 (prior outfits have the older style fork piece) and 1937 (when the shoulder is clearly visible in the new numeric outfit manuals), but further research is needed to pin it down more closely than this. The second variation in the fork piece is shown in the photo to the left. The earlier fork pieces (including the earliest type without a shoulder) have flat ends to each fork 'tine'. At some point post-war, the ends become curved to fit 'around' a collar mounted in the fork. Again, this is hard to distinguish but so far I believe it is during the medium red period, between 1950 and 1958. With the reintroduction of French Meccano to the UK after the demise of Binns Road, this shaped end to the fork piece disappears again, as can be seen from the late 80s version in the photo to the right. Are all French fork pieces like this? Many changes that were made in Binns Road post-war were not copied by the French factory and so minor variations like this can continue through their production. Another difference between the UK and later French production is the height of the shoulder (as in this photo to the left). The later French part on the right has a much shorter shoulder around the boss. Note that, unlike the large fork piece, the boss on the small fork piece was never deliberately aligned with the fork and so the position of the boss tapping is random. Now I've received an email from Dawn Barry, stating that the bosses on small fork pieces do line up, out of a sample of three dozen. So I dug out a hundred or more here, and found that about 25% of my part 116a's had precisely aligned bosses, but the rest didn't. 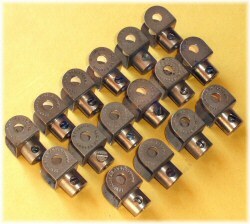 A good number appear to be fairly well in line, but inserting a screwed rod shows that they're not bang on. The pair above, like most of the part 116a's on this page, don't line up. Perhaps many were made in a rough attempt to have them line up, or perhaps it was just easier to drill and tap the parts a certain way around? There appears to be the same percentage of lined up bosses from the earliest type to the the zinc plated ones. If you find anything different, please contact us. To the left, a box of three large fork pieces dating from 1958-63 (the light green label indicates light green parts). To the right, a box of three small fork pieces. As these are unpainted parts this box could be any time from 1954 (when the part code 12418 was added) through to the mid-60s. Notes: ¹ Since pre-war medium green parts start from 1933, there should be some of these with the boss randomly oriented – do you have one? ² DMS/EMP shows a nickel-plated large fork piece from 1964-70, but this is believed to have changed in 1962 along with many other parts, and changed to zinc in 1966. ³ These are very rare, but we don't know whether they're early or late in the dark red / dark green period yet. 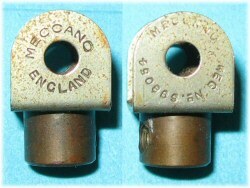 According to the Meccano Limited drawings which have now emerged, the "cupping" on the small fork piece was noted on the part drawing on the 20th January 1931. The part in that manual looks like 11a, rather than 102, even though it wasn't introduced until 1962. Barry: I completely agree that the fork piece is both visually and mechanically superior to using a bent strip and two collars. I continue to think, however, that discussing the merits (or otherwise) of using part 102 and two collars is a bit academic as (unless the part had an early and undocumented "wider" phase) it isn't physically possible to fit a collar inside part 102. The 1924 and 1925 manuals are indeed strange. As you say the parts lists for model 307 reverts entirely to its 1922 form. Not only does part 116 disappear but the double angle strips go back to their pre-1923 parts numbers (e.g. part 48a goes back to being part 60). I had a good look at the model that was described in that form from 1922 to 1927. The version introduced in 1922 using part 102 and two collars would have been a bit flimsy at that point and I suspect that part #116 was introduced to improve the model. However the picture was not updated til 1926 and the parts list from 1924 thru 1925 was returned to the 1922 format. There is probably an interesting story about anomoly. I don't think that the appearance of part 116 in the parts list for model 307 in the 1923 manual was in fact a typo. Rather I think it was understood that the model required the part and that is is why it was included. To my mind the real error is the inclusion of part 102 in the list. This is problematic for two reasons: part 102 was not included in set 3 and in any case it is too narrow to be used as shown in the diagram. To make things work one would need the part identified in the discussion of part 44 as being "midway between a 102 and an 11a". Part 116, on the other hand, does the job nicely even if it is perhaps a tad too wide to be ideal. I can't explain how part 116 is not listed in the 1924 (and 1925) manual, but note that in the 1926 manual they finally got things more or less right. Part 116 is listed and the illustration shows its use, but strangely part 102 is still listed despite not being used. I have emailed pictures of the later nickel plated version of this part (.ni2).